You already know about the benefits of having a humidifier in your home. If anything’s holding you back, it could be the constant maintenance you might expect with having a humidifier, or perhaps it’s the threat of added expense with filter changes. You might not know that there are plenty of filter-free humidifiers out there that won’t require you to clean or change a filter every two weeks, month, or season. The best filterless humidifier operates quietly, so you can keep it in your bedroom, your baby’s nursery, or in the living room, and you shouldn’t be disturbed at all. Many includes unique features, such as aromatherapy pads or trays, timers, humidistats, and remote controls. Of course, the more features, the higher the cost, but you don’t have to spend lots of money to get a high-quality filterless humidifier. 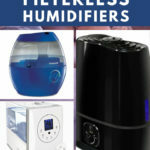 You just have to seek out the one that has the features you need and want, and one of the best ways to do that is to read up on filterless humidifiers in a guide like this one. What’s the Deal with Filters in Humidifiers, Anyway? What is that White Dust, Anyway? How Do You Clean a Humidifier Filter?